I have just uploaded a brand new necklace tutorial for the Prumihimo disk and when I looked back over my records I was surprised to see how long it has been since I offered a new tutorial. Working on new designs is my absolute favourite kumihimo activity, so why has it been so long? In November I published two new bracelet designs. Candy Cuff is a double bracelet design using 2-hole flat backed round beads, called Candy Beads and Desdemona is a single braid bracelet, featuring embellishment on 2 sides using lentil beads. I like to work with unusual bead shapes, such as these, because I enjoy the challenge of working with something new and fresh, which has not been widely used with kumihimo, if at all. Last week I wrote a supplement for the Candy Bead tutorial, which shows how to adapt the instructions to use a similar bead, the 2-hole baroque cabochon. New purchasers of this tutorial will receive the supplement and those who have already purchased it can contact me and I will send the supplement. Both of these tutorials are made on the Prumihimo disk. I am aware that many people prefer to use their stash, rather than having to purchase expenisive new beads. 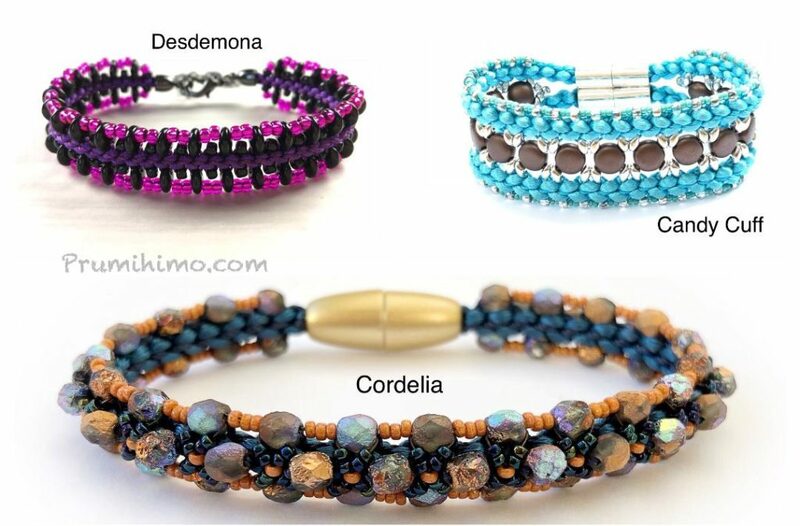 My Cordelia bracelet is a good example of a tutorial requiring only simple, widely available beads, such as 4mm rounds and seed beads. 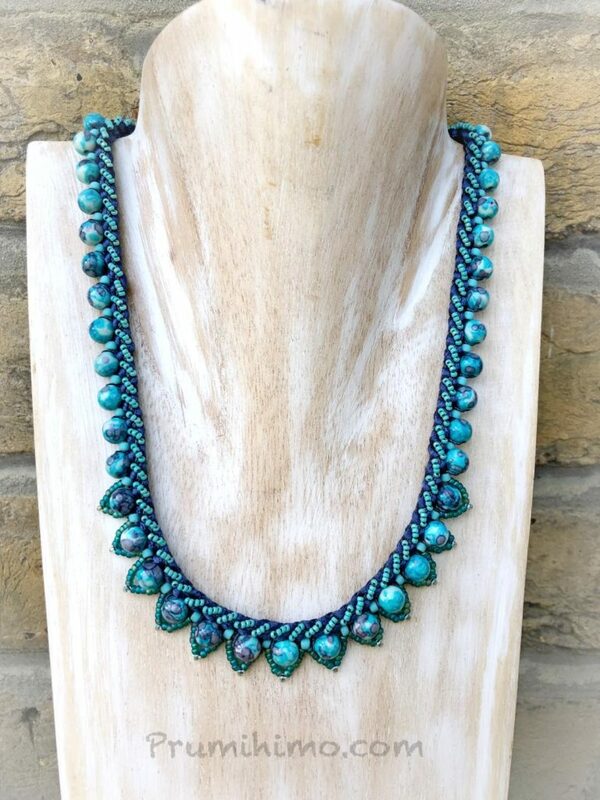 I enjoy the challenge of that sort of design as well because I have to try to achieve a new effect with familiar beads, rather than being able to allow an exciting new bead to do all the work! Since November I have been very busy with Christmas, a vacation and family issues, so I have just not been able to find the time to design something new and to get it written up as a tutorial. The Viola necklace came about almost by accident. I needed to find something to enter for a challenge, but I did not have time to start from scratch, so I hunted though my designs and found a simple necklace made on the Prumihimo disk. Then I set about working on embellishment to give it a fresh new look. First I created the embellishment at the front of the necklace to give it a bit more impact and to provide some interesting shaping. Once that was finished I felt it needed something more, so I found a new way of embellishing the braid, which added intricacy, while still allowing the underlying braid to show through. Once it was finished I was so pleased with it that I wanted to share it as a tutorial. Writing up a basic tutorial generally takes only a couple of days, but I believe it is important to work on different variations of the design, so that different options can be offered. This is particularly important for kumihimo because the precise size of the cord and beads used will affect the spacing of the design. There are always slight variations in size between seed beads from different manufacturers and the variation in cord width and firmness is even more diverse. By making up my design several times with slightly different cords and beads I am able to anticipate problems people may have and find a solution. It helps me to understand my own design better and it often stimulates my imagination for new ideas for future tutorials. I really enjoy this part of the process and it ties in with my belief that a tutorial should offer more than just how to make the one design on the front cover. By offering variations and lots of additional suggestions I hope to encourage people to explore the possibilities and expand their skills. I have received lots of very postitive feedback on this issue, which makes all the hard work worthwhile! The new tutorial has been named Viola (after Shakespeare’s heroine) and I hope it will be welcomed by those who like a stash-busting design. 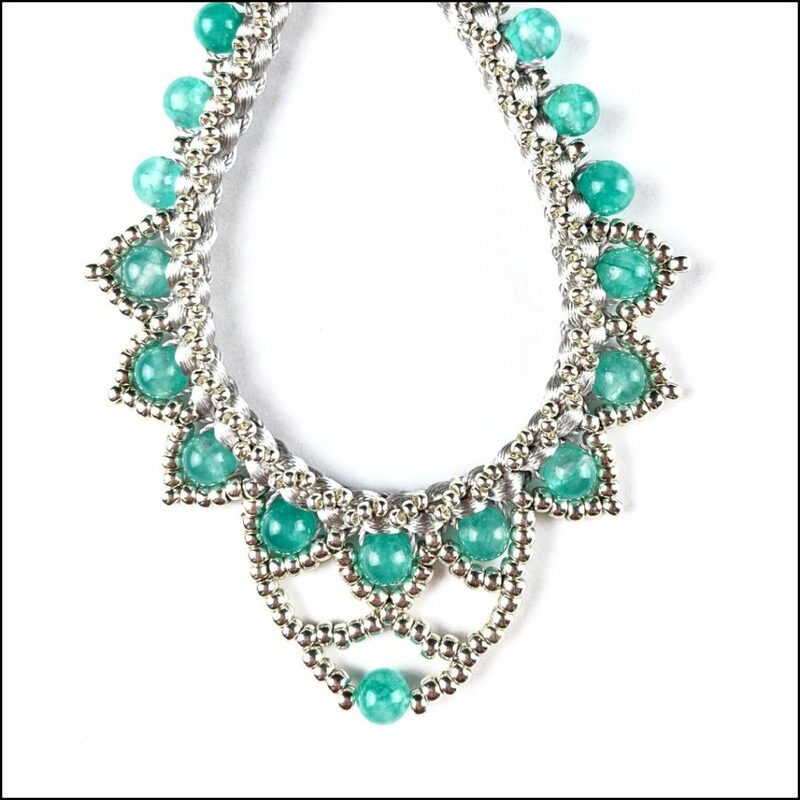 It features 6mm round beads of any type. This is a really popular size of bead and can be found made of many different materials, such as gemstones, glass and wooden beads. It would also work with pearls, but as the design requires even sized beads I would recommend glass pearls, rather than freshwater pearls. Apart from that all that is needed is cord and seed beads, plus a clasp. 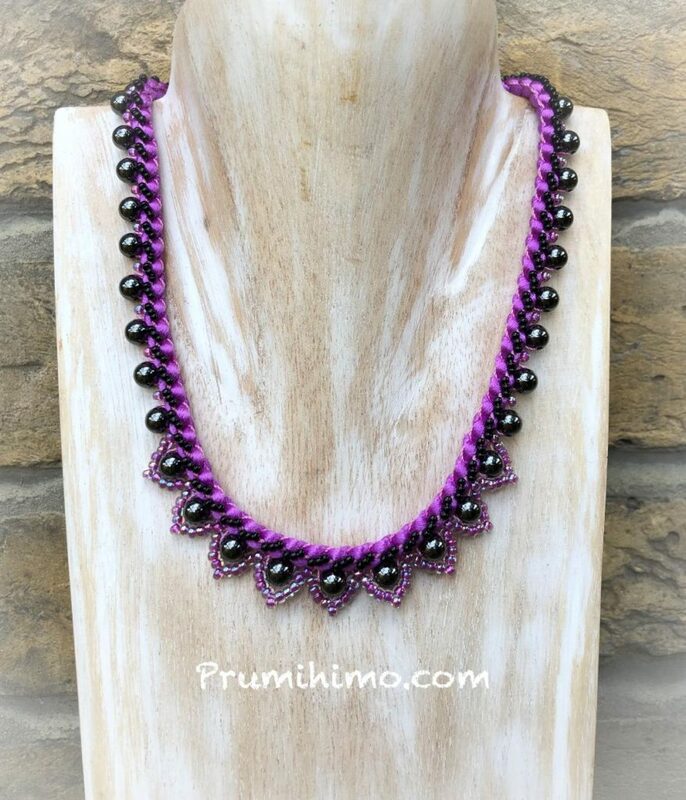 The necklace is made on the Prumihimo disk because it allows the beads to be braided in straight rows. This also means that it is quick to make up and economical with the beads. There are two different techniques for embellishment, using a beading needle and thread. Even complete newcomers to bead stitching should be able to complete this design because I provide lots of general advice to ensure success. For those who may be interested in developing their own embellishment techniques this tutorial would be a good starting point. All of these tutorials can be found in my shop. They are very competitively priced at £5 each (approx US$6.75). Please also check out my free shipping offer on my Kumihimo Endings book when you buy both Desdemona and Candy Cuff.